This week: This time, I think about the risky South Pole medical evacuation flight that took place this week in order fly two patients out of Antarctica for medical treatment unavailable at the remote research station. Overwintering at one of the research station that are built in Antarctice is, despite all the technologically advanced equipment, still a challenging task. The crews are isolated in their remote stations for about 9 months during which they can not get new supplies or any other help in case of a problem. Amongst other things, fire is one of the biggest threats as it can severely damage the infrastructure which protects the crew members during the long polar winter. Another threat can be severe injuries or deseases as, due to the harsh environment, evacuations are very risky and mostly impossible. Therefore, each research station also features a small hospital that allows the stations‘ physicians to treat most of the injuries and deseases that can occur. However, this was not possible for one of the workers who stayed at the Amundsen-Scott South Polar station this austral winter as this crew member required a level of medical care that is not possible at the station’s hospital. Therefore, officials with the Nation Science Foundation decided to launch a medical evacuation flight in order to fly this patient out of Antarctica for the much needed medical treatment which is unavailable at the remote station. 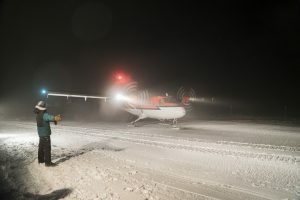 A Twin Otter aircraft on a medical evacuation flight taxis on the skiway at NSF’s Amundsen-Scott South Pole Station. Credit: Robert Schwarz, National Science Foundation. A medical evacuation flight during the strong polar winter is everything but a simple task. During the winter, temperatures can be that low that fuel becomes a slush, thus requiring the fuel to be heated before and during the flight. Also, the low temperatures pose a threat for the hydraulic systems of a C-130 Hercules aircraft that would normally be the perfect choice for such a mission. The only airplane that is built for flying in very low temperatures is the Twin Otter which already was used for two previous mid winter evacuation flights conducted by Kenn Borek Air. Until the first winter flight in 2001, it was considered as impossible due to the very low temperatures and the rapidly changing weather in Antarctica. The medical evacuation flight began with the long journey of two Kenn Borek Air Twin Otter airplanes from Canada to the British Rothera base on the Antarctic Peninsula. While one of the two aircrafts began the 10-hour long flight to the Amundsen-Scott station, which is more than 2400km away from Rothera base, the other Twin Otter remained at Rothera in case of search-and-rescue mission. In addition to the very long distance and the harsh weather conditions, the flight takes place in the permanent darkness of the long polar night. Aside from the environmental conditions, this flight is especially challenging as the Twin Otter is the only aircraft that will be flying over Antarctica at this time. Also, the with huge additional tanks equipped Twin Otter can fly for 12 hours and thus, after the first 6 hours of flight, the pilots reach the famous point of no return. After this time, they do not have enough fuel on board to return to the station where they began their flight. Luckily, everything went flawlessly and the Twin Otter made it to the Amundsen-Scott station on June 21st and, after a 10-hour long rest period, the aircraft successfully returned with two sick patients to Rothera base on June 22nd. This medical evacuation flight was an impressive demonstration of collaboration, technology and endurance. This week: This time, I think about the epic-win I felt as I managed to complete a very challenging and dramatic operation in XCOM 2. 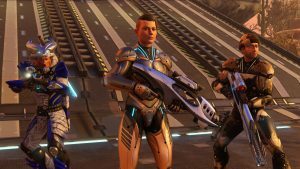 XCOM 2, a turn bases strategy game, puts the players into the role of the commander of the XCOM which is a special force fighting against an alien invasion. The gameplay itself is segmented into two main phases. On the one hand, the players have to manage the own base, conduct research and prepare their soldiers for operations against the alien invaders. On the other hand, the players also tactically command up to six soldiers during an operation with the goal to eliminate all hostiles or to complete a certain task, such as extracting a VIP or destroying an alien facility. The latter phase takes place in a turn based format. All units can use two actions per turn and once all actions are used the player’s turn is over and the computer starts to control the enemy units. In general, the goal is to take out enemies by tactically moving the own soldiers so that they get into superior positions, thus allowing them to eliminate the alien’s forces. Also, the player has access to special abilities, needs to make sure all soldiers have reloaded their weapons or get healed once they got injured by an enemy. As I progressed through the campaign of XCOM 2, I suddenly reached a certain point in the story at which the player’s base, which is a huge spacecraft, gets attacked by an UFO and has to crash-land. The spacecraft itself gets not severely damaged, but it can not start its engines again as the aliens have activated a special disruptor beacon which override the ship’s system. Thus, the player suddenly faces the challenge of defending the own base and destroying the disruptor in order to escape the approaching alien forces. This special operation begins like any other operation by sending the player’s soldiers to the target area which is, in this case, just outside of the player’s base. Once the soldiers are deployed, the player immediately gets attacked by some enemies and has to establish a secure position. However, the player can not only defend the own position against the constant stream of incoming reinforcements as the second main goal is to destroy the disruptor beacon. Moreover, the constant stream of new enemies increase the chances that the player gets overrung an some poin as the player’s soldiers only have a limited amount of ammunition and special attacks. In addition, certain abilities of the player’s soldiers do have a cooldown and need to recharge after being used. Therefore, the player has to start proceeding towards the disruptor while dealing with new aliens joining the battle. As I played this mission, I constantly felt the pressure to move forward as aggressiv as possible in order to destroy the alien’s disrupter beacon as soon as possible. Thus, I decided to move only a two of my soldiers forward to destroy the beacon while keeping the others a bit behind in order to deal with incoming reinforcements. As I finally destroyed the beacon, a truel fight for survival began as the alien’s started to bring more and more reinforcements to the battle field which landed between my two soldiers who destroyed the disruptor and the extraction zone. Hence, I could not just fall back as this would have exposed my soldiers to the reinforcements. This left me with only one way to get my soldiers out alive: I had to support them with my other soldiers who were still in a defense position and slowly move them back to the extraction zone. As I finally managed to get all my soldiers to the extraction zone without anyone being wounded, I was completely overwhelmed. In contrast to a regular mission, I was constantly in a fight and I never had the chance to recover between incoming reinforcements. Usually, I would make sure that all the soldiers have reloaded their weapons and are in a good position to engage the next group. During this mission, however, this was not possible. In addition, a player normally encounters about 10 enemies during a mission on average. After this mission, I dealt with more than 30 enemy units. Hence, as I finally managed to get all my soldiers back to the extraction point alive, I experienced the overwhelming feeling of an epic-win. An epic-win is a special overwhelming feeling that occurs when a player manages to perfectly solve a challenge that seemed impossible, the player recovers from a bad situation or achieves a goal with a team of other players in an unexpected way. In my case, I managed to perfectly overcome a challenge that seemed impossible throughout the whole mission. Especially towards the end of this operation, as several of my soldiers were out of ammunition already, I reached a point at which a small mistake would have led to a potential loss of one of my soldiers. Therefore, completing this mission in a perfect way was a fantastic feeling and I felt as if I could exhaust any other challenge XCOM 2 will throw at me. This week: This time, I think about the results of the introduction of my community event for a Minecraft server. 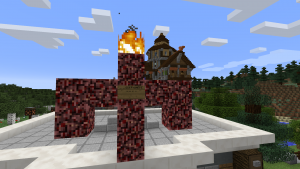 The introduction of my Minecraft server community event was a success. Not only the other members enjoyed the emergence of some wicked statues at central locations, they also started to speculate who the creator of those statues is and what goal this evil force tries to achieve. Furthermore, I enhanced the players‘ involvement by attaching signs to the statues that provided the players with a clear message. However, as each statue had only one word attached to it, the players were challenged to go on a small scavanger hunt in order to find all the different statues allowing them to decipher the message. The statues are delivering a message. Interestingly, the narration of my server event received an additional story arc, as, by accident, a player had some bad luck with a chicken the same time as I began to introduce the server event. Thus, the player started to develop an own story arc that put this chicken into the central position of this conspiracy. This outcome showed the effectiveness of slowly teasing the server event as players started to become aware that something was going on but had no clear idea what exactly was causing this. With this additional story arc being part of the server event, it is important to include or at least address it in the narration of the community event to emphasize the creation of spinoffs and to add some more authenticity to the main event. Also, players who are creating video content used the event’s prologue for their own narrations and helped to spread the word by making the wicked statues an important part of their videos. In the meantime, I was busy to prepare the first chapter of this server event and to address the spinoff in this process. By now, the preparation is finished and I just wait for the ideal moment to bring forth the community event. In sum, the slow introduction of the community event was a success as the whole server’s population is now aware of the event’s existence and has begun to speculate about its continuation. Now, it is critical to release the first main part of the story to increase the players‘ excitement and enjoyment. This week: This time, I think about the changes of the Conelanders league that took place since I presented this online community for the very first time. In article #150, I presented the Conelanders league which is a small community of computer game players who enjoy playing racing games and uploading videos of their runs to YouTube. In particular, the Conelanders league featured weekly DiRT Rally events which could be completed by the league’s members. Also, the league was created with the intention to give every player the chance to participate in the virtual racing events without having to be really competitive. Of course, some drivers enjoyed the competition with other drivers as well, but the main idea was to just have fun and to share the runs with others. Since the early days of the Conelanders league, many new drivers have joined the league and formed a supportive community. By now, the DiRT Rally league has 191 members in total of which at least 50 have participated in every event. Furthermore, skilled and more experienced drivers help and support others to improve their driving skills and no one really focusses too much on the competition. 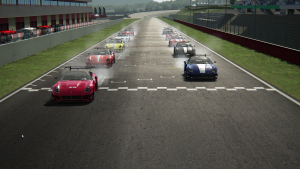 In addition, the Conelanders league expanded in May as Assetto Corsa became the second racing game that is played by the community. In contrast to DiRT Rally, Assetto Corsa features circuit races during which the drivers directly compete against each other. The goal of the Assetto Corsa races is to create exciting content that allows the viewers to watch the races from any perspective. After the first season, this new format already showed its potential which will be refined over the upcoming seasons. Moreover, some members of the league provided additional input to increase the spirit of this community. For instance, a database was created that shows the results of every Conelanders race and allows users to explore the career of every driver. Also, custom liveries were created for the Assetto Corsa cars to add a certain style to all the circuit races. Finally, the races were even commentated the same way as real world races. Ultimately, the Conelanders league shows the potential of online communities that work together and try to achieve something meaningful. Players from all over the world are united by the spirit of racing and created a huge amount of data within a short amount of time.